Medjugorje is a popular town in Bosnia-Herzegovina; if you are planning to visit this town these few Medjugorje Practical Information tips will help you plan and have a hassle-free holiday. Bosnia and Herzegovina’s Konvertibilna Marka (BAM) = 100 pfenings. Notes are in denominations of BAM 200, 100, 50, 20, 10 and 5. Coins are available in denominations of BAM 5, 2 and 1 as well as 50, 20, 10 and 5 pfenings. Most Euro notes - but not coins - are widely accepted. There is not very much at all to Medjugorje Nightlife, and the town can get very quiet in the evenings and at night. 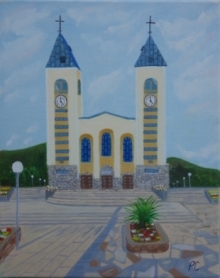 But as much as the “traditional” forms of night entertainment such as pubs, bars and clubs are lacking in Medjugorje, the town is most interesting when it is dark, as tourists get to make up along the way what the best activities of the town at night are. Here are a few options. When it comes to Medjugorje Festivals, the first one you will hear about is the annual Youth Prayer Festival. The locals call it Mladifest. It is held every first week of August and brings together more than 50,000 young people and more than 400 priests from around the world. Medjugorje is a small mountain village in Bosnia-Hercegovina, the former Yugoslavia. Since the first apparition of the Gospa to six children on June 24, 1981 on the hill of Podbrdo of Mount Crnica (now called Apparition Hill), the entire region has been caught in the controversy of the apparitions and the messages of Gospa. Why this small village was chosen by the Blessed Mother to be the place she would again repeat her messages of Lourdes and Fatima.. that of peace and prayer.. are a divine mystery. Certainly nothing in the history of Medjugorje suggested that in this communist nation would be a fertile place to encourage prayer, conversion and devotion to God. Bosnia-Hercegovina is multi-ethnic claiming Serbs, Croats, and over 30 percent Muslims. The disintegration of Yugoslavia in 1991 led Bosnia and Hercegovina to declare its independence along with Croatia, Slovenia and Macedonia. How did the village of Medjugorje survive the horrors of war?